Just like David mentioned last night, I sometimes like to sample the products on the shelves of my local stores. What’s really neat is that liquor stores in particular often have a lot of specialty products that your average grocery store does not carry. So, a while back, I wandered into a nearby Liquid Town, hoping to find some neat products for Salsa Month. Something else caught my eye, though – a little jar of bruschetta. What was especially interesting about this jar was that the first word on there was “Piquillo,” a pepper you may not hear much about unless you frequently make tapas. Needless to say, I was intrigued. I love Italian-style flavors, but I’d only ever had bruschetta as an appetizer at restaurants. To make a long story short, I caved to the intrigue, and I’ve finally cracked open the jar for tonight’s review. The jalapenos are rather far down on the list, but it is also a short list anyway. 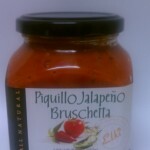 Besides, the piquillo peppers, the first thing mentioned on the label, are right up top, so that’s fine with me. What’s cool is that I tend to think of bruschetta as a tomato-based dish, but tomato paste plays second fiddle to the peppers. The only downside to this list is that it is, in fact, tomato paste, as I would prefer to see something a bit fresher and more natural, or perhaps even some sun-dried tomatoes. Well, it sure does look like tomato paste. While I do see some pepper seeds in there, this bruschetta mostly just looks like red goop. It has the same consistency as tomato paste as well, meaning you don’t have to worry about it flowing or spilling everywhere. Thanks to the tomatoes, onions, and peppers, this product smells a lot like a salsa, and a particularly appetizing one at that. In terms of taste, it’s more like a cross between the aforementioned salsa and a typical spaghetti sauce, with a predominantly tomato flavor that carries hints of peppers and other spices. Sure, this stuff has two types of peppers in it, but neither of them rates very high on the Scoville scale (for reference, piquillo peppers rate a paltry 100-500). I have no qualms about giving it a Mild, as it has hardly any kick unless you eat a lot of it very quickly, and even then it barely registers. I really wish, though, that it packed a bit more flavor. What’s there is good, but feels really unbalanced, as the tomatoes rule over everything. What’s here is basically a slightly peppery tomato paste; it isn’t bad, and is actually tasty, but ultimately a little disappointing. I’ll give it a Nominal, because I do like it. I just wish it could have been more. Rather than using this as a mere bruschetta and scraping it onto some toast, I recommend using it as a base sauce for larger dishes. Try spreading it on a chicken and vegetable wrap, for example. I bet it would also make a nice pizza sauce, though you may have to limit it to smaller personal pizzas (of the English muffin or bagel variety, perhaps). Seriously, though. With the right combination of cheese, meat, and extra herbs and spices, this stuff could make a great addition to a lot of dishes. It just needs a little help. The word “piquillo” is Spanish for “little beak,” and refers to the pepper’s distinct pointy shape.